I’ve always been of the opinion that an empty (or mostly-empty) fuel tank or can is a far greater hazard than a full one, so it was time to set this fuel can outside the Garage Majal. 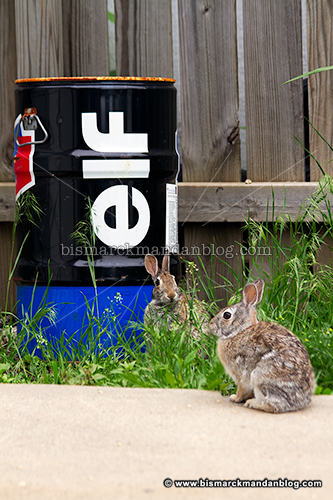 I can’t say with any certainty that it’s responsible for the bunnies hanging out nearby, but it probably can’t hurt. This stuff smells so AMAZING in the tank or after it exits your exhaust pipe, I’ve always described it as high speed perfume. Spendy, too – I got this drum from the factory Kawasaki team but I don’t know how to import it. I’m of the understanding that at the time it was about several times as expensive as pump gas or even the Turbo Blue race fuel I buy here in town at Racer Performance Center. I guess the local rabbits have distinguished noses! This entry was posted in Motorcycles, Wildlife by Clint. Bookmark the permalink.